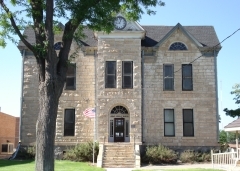 Located near Tribune's central commercial district, the (old) Greeley County Courthouse stands adjacent to the present courthouse. Designed by W. T. Heaps and constructed in 1889-90, the two-story stone building has a galvanized iron cornice, cross gable roof, and exemplifies a simplified Italianate style. Allen and Oleson of Ness City were general contractors with William Ruff, also of Ness City, doing all carpentry work. When a new courthouse was constructed in 1973, the Greeley County Historical Society moved to the building and since has utilized the space as a museum. It was nominated in the areas of architecture and government.